Maximuscle’s MAXI-EFA® packs more essential fatty acids into one capsule than any other product on the market. Tested to be free of PCBs, dioxins and mercury, this super potent fish oil is rich in the essential long-chain Omega-3 fatty acids (EPA/DHA), shown in research to help the body function well in many areas that are vital to health, fat loss and physique development. Each capsule also provides 100mg of GLA, equivalent to 1000mg of evening primose oil. This unique formula is fortified with vitamin E to prevent oxidative damage to these sensitive fatty acids. With over 2 years of research, Maximuscle’s MAXI-EFA is now the strongest product of its kind. We challenge you to find better! 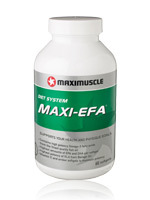 It is easy to incorporate MAXI-EFA into your fat loss plan. 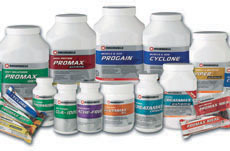 Latest research shows beneficial results at just 3g daily, with 6g daily showing maximum results. Therefore you can take 3-6 MAXI-EFA capsules daily, according to your requirements. 4 capsules is good recommended daily use. Latest research shows beneficial results at just 3g daily, with 6g daily showing maximum results. Therefore you can take either 3-6 Maximuscle’s MAXI-EFA capsules daily, according to your requirements. 4 capsules is a good recommended daily use.